1. 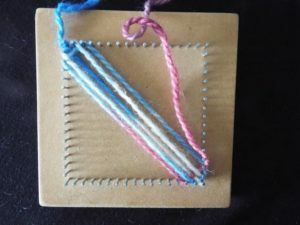 Tie yarn to corner nail. Then take yarn diagonally across board and around diagonally opposite nail. Do not wind the yarn right around the nail. The nail is simply to hold the yarn in position. 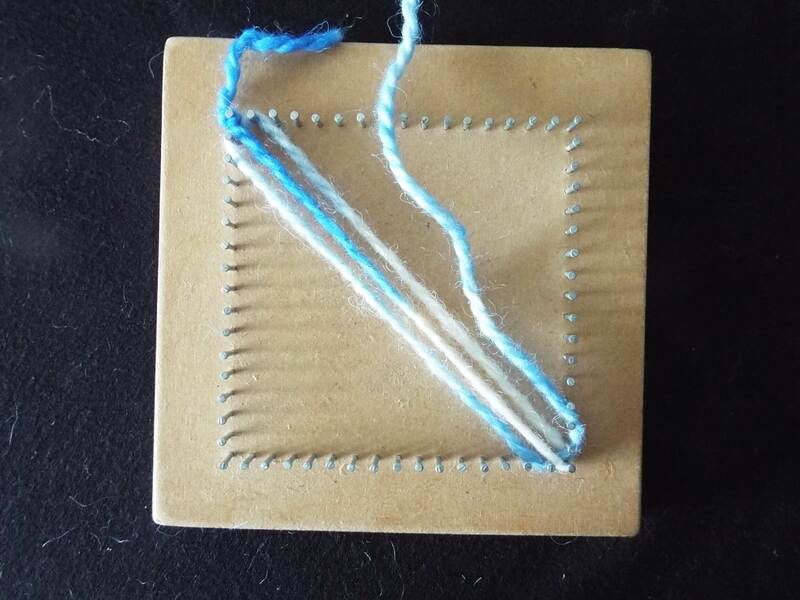 Yarn tension should be firm, and this tension should be maintained throughout subsequent weaving. 2. 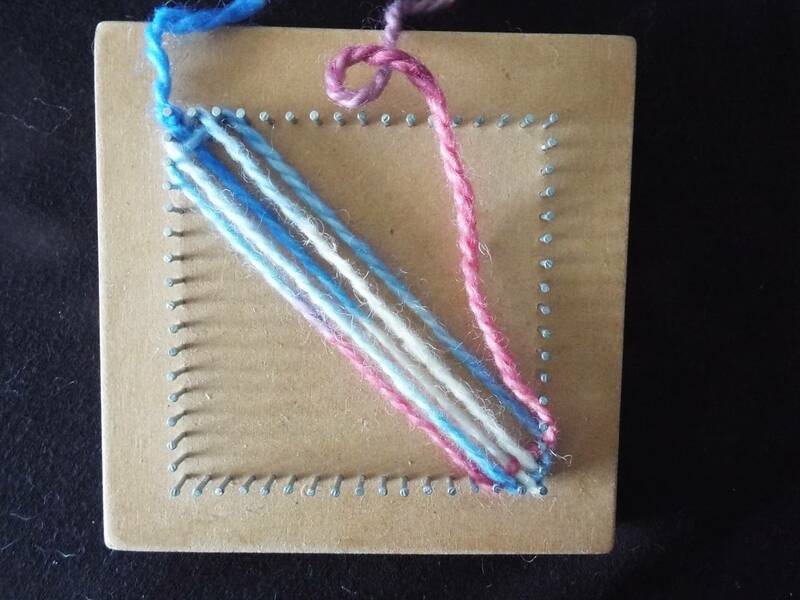 Take yarn up and around next nail, then diagonally across board and around the nail next to corner nail, without crossing the initial diagonal thread. 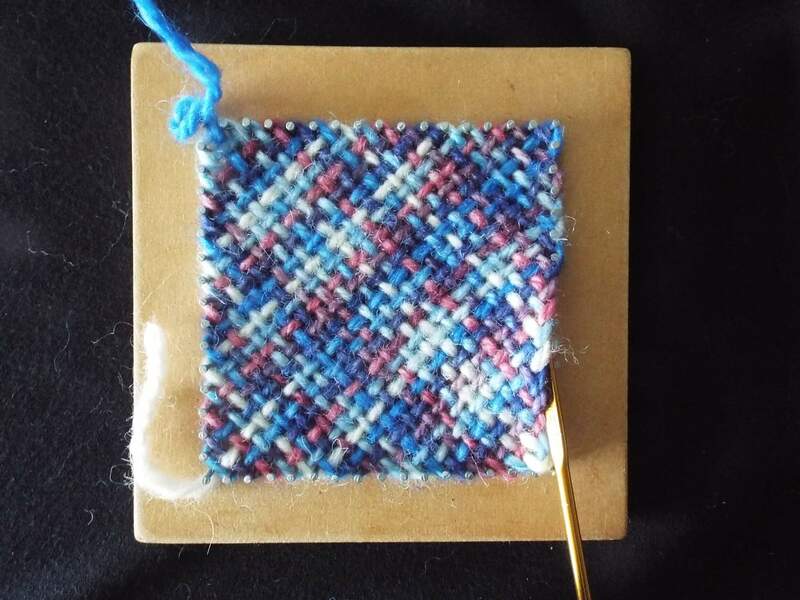 Then pull a loop of the yarn under the first diagonal thread. 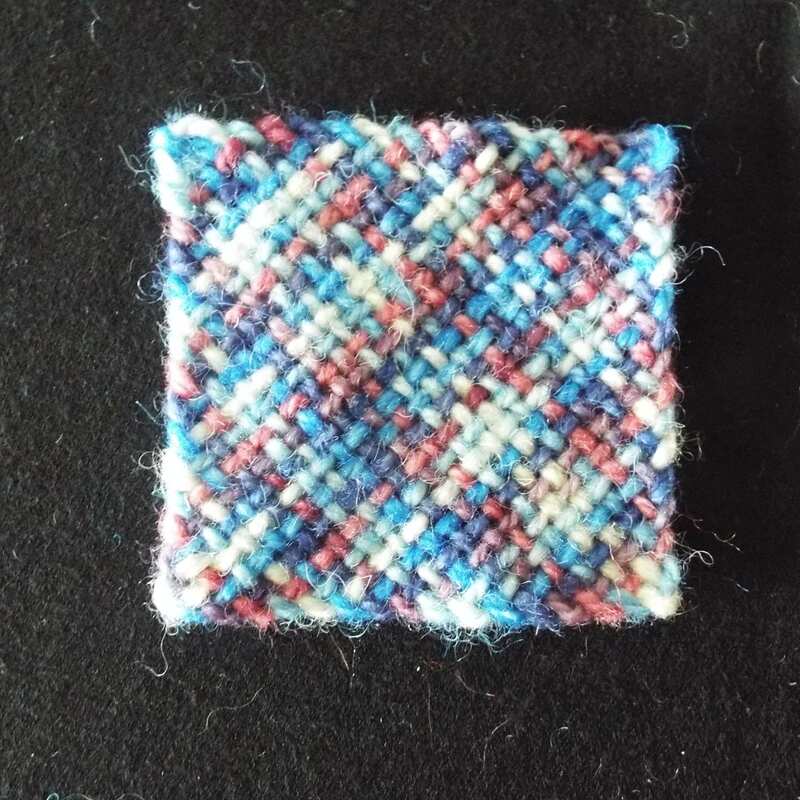 This is the beginning of the weaving process. 3. 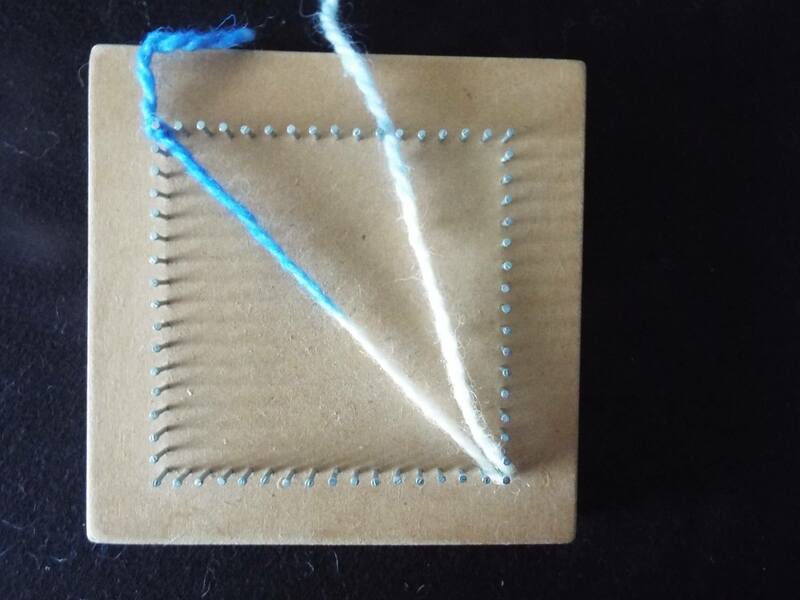 Place the woven loop around the nails to the left of the first diagonal thread at top and bottom of board. Pull yarn loop firm, but not tight. 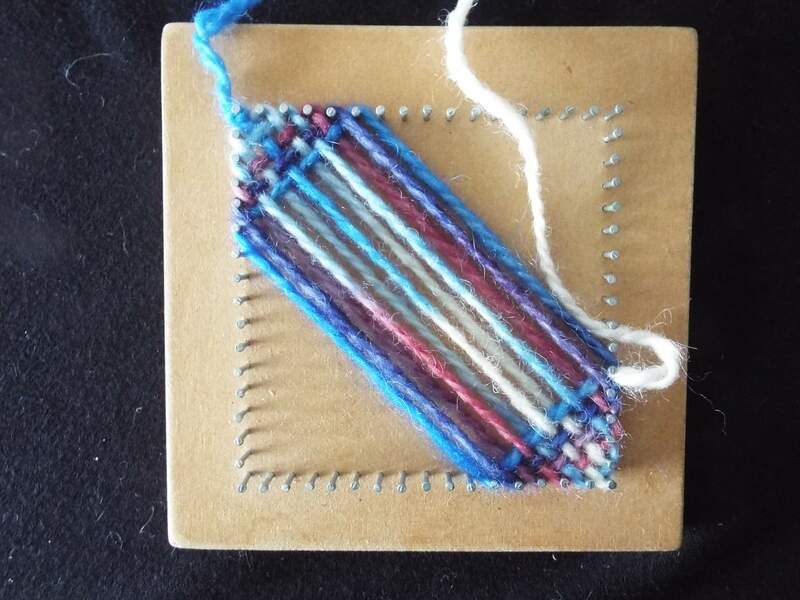 Note that because it was a loop that has been woven, weaving occurs at both ends of the board. 4. 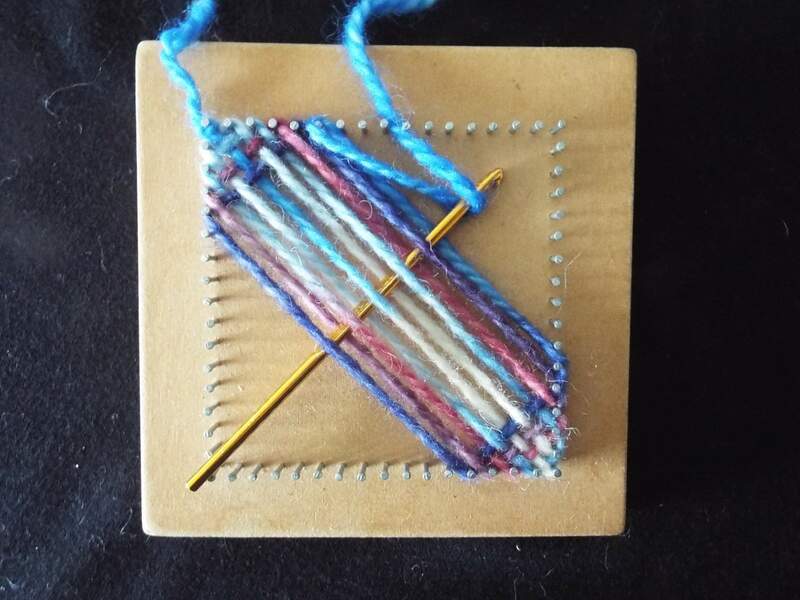 Take the weaving yarn up one nail, back across the board, and around the next nail along the top edge. 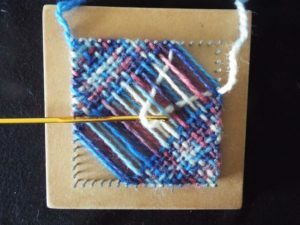 Then weave a new loop through the diagonal threads, such that the over and under pattern is opposite to the previously woven loop. Initial loops are easy to weave with fingers, but as work progresses, a crochet hook makes it easier. 5. Place the loop around nails at the opposite ends of the board and pull firm. Push woven threads up or down until they form straight lines between the nails. It is much easier to do this at each round rather than leaving it till later, as it affects tension. 6. Continue weaving loops of yarn. 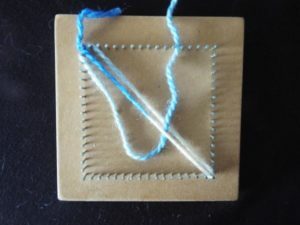 When using the crochet hook, it is useful to weave under and over several diagonal threads at once. If the first woven loop went under the initial diagonal thread, then insert the crochet hook under the first, third, fifth threads to get the correct shed (under and over arrangement), for weaving all subsequent loops. 7. Pull yarn loop under several diagonal threads at the same time using a crochet hook to speed the weaving process. 8. 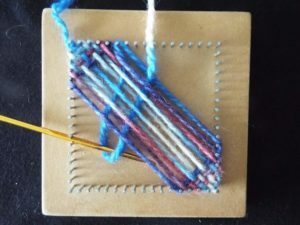 Place yarn loop around appropriate nails and pull firm, remembering to press the threads into straight lines between the nails. If weaving with thicker yarns, this is particularly important, as it can be very much harder to do once the weaving has progressed past half way. 9. 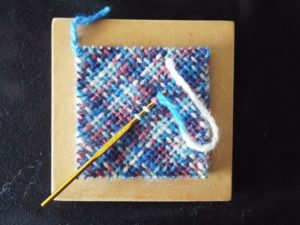 As weaving progresses, it can become difficult to weave loops in one go, so insert the crochet hook part way through the path of the loop, and pull through approximately the full size loop, then insert the crochet hook further across the work to finish the weaving the whole loop. Some people like to use a hook with a long shaft so the loop can be woven in one go, but I find the staged process easier. 10. 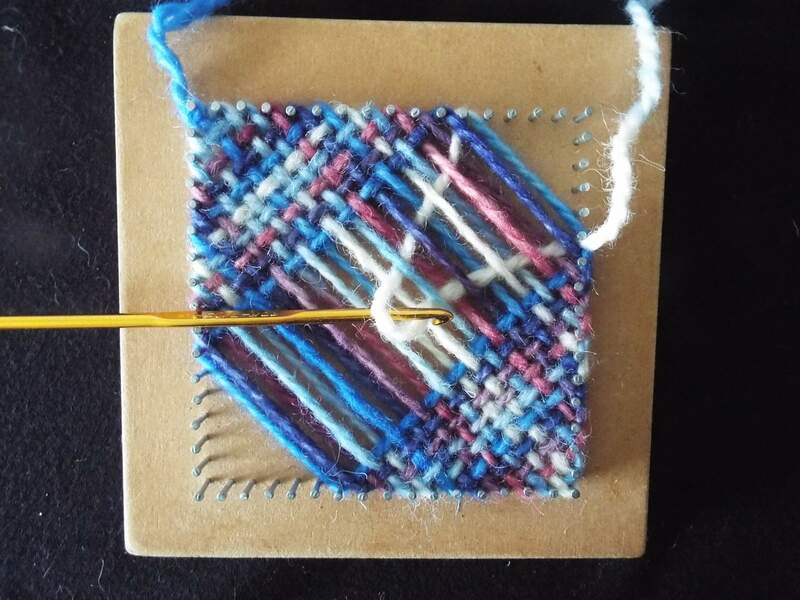 Continue weaving until there are only two, diagonally opposite, nails left unused. Lay the yarn diagonally across the board and add about 4 cm for a tail. Cut the yarn at that point. 11. 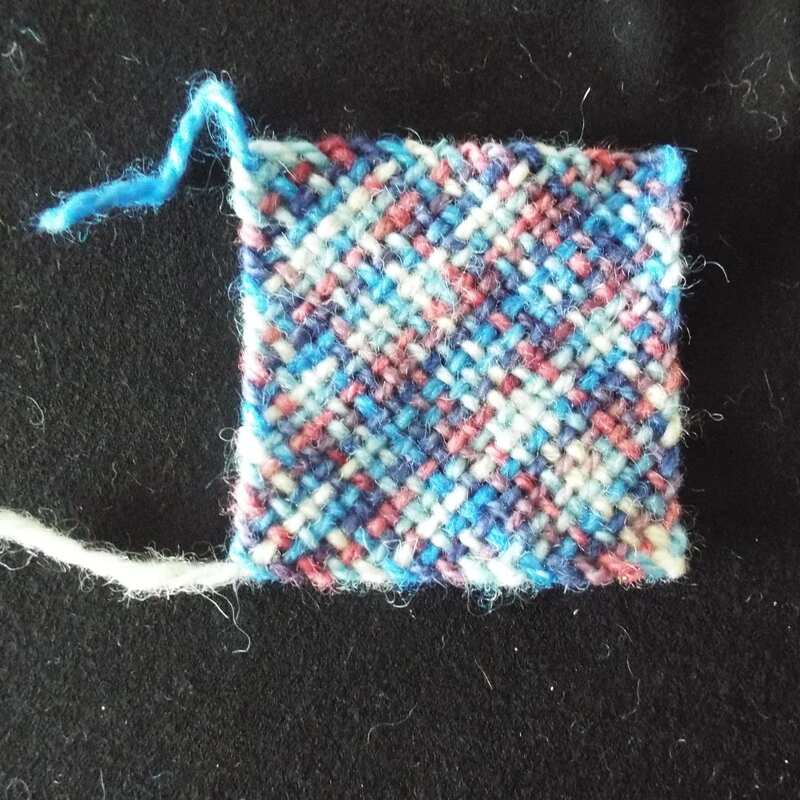 Weave the final diagonal thread – not a loop – which will probably need to be done in several stages. The final thread may be harder to weave than previous loops, and if so use the crochet hook to weave under every alternate threat one at a time. 12. 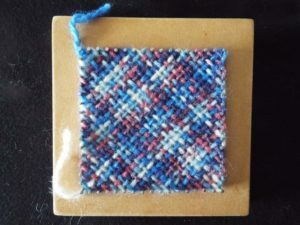 The final diagonal thread locks all the other loops in place, and completes the weaving of the square. 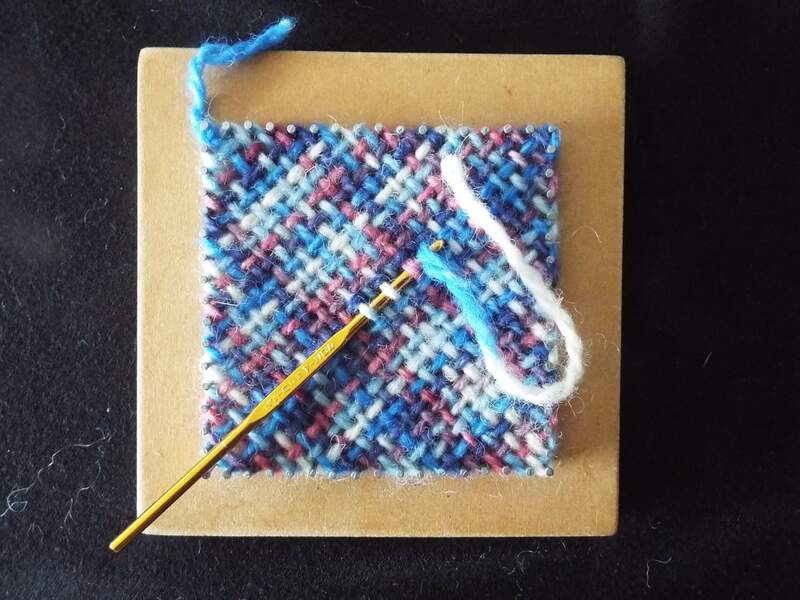 Untie the knot at the start of the weaving so the weaving can be easily lifted off the board using the method in step 13. 13. 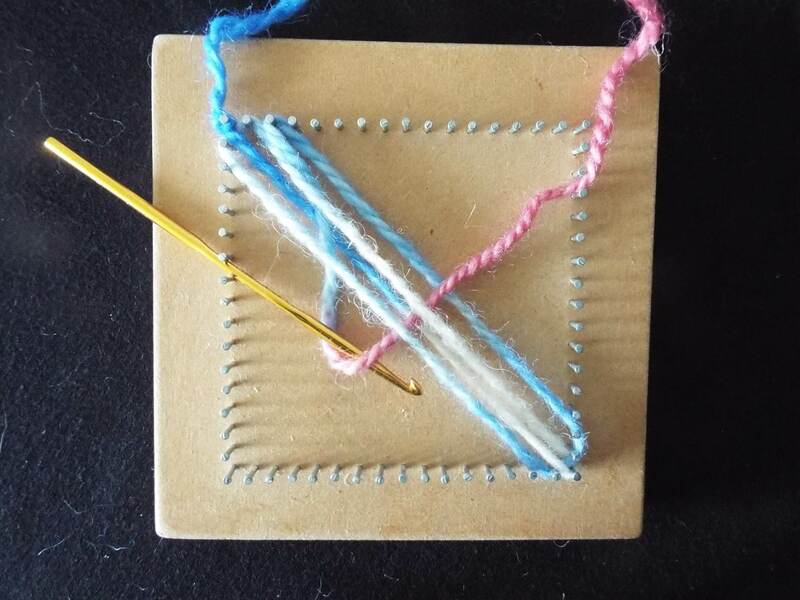 To remove the square from the board, turn the crochet hook upside down (so the hook doesn’t catch) and starting at a corner, run it along one side inside the nails, to lift the weaving off the nails. Repeat on the other three sides, and the woven square falls off the board. 14. 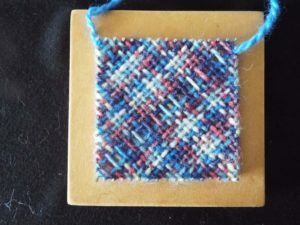 The weaving has four finished edges, and a starting and finishing tail of yarn. Use the crochet hook to weave in the yarn ends. 15. 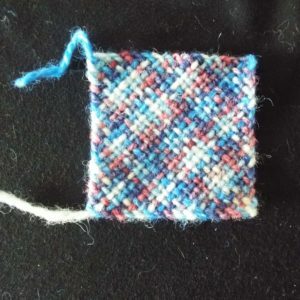 The finished diagonally woven square. Use as a mat or join squares to make a larger piece of fabric.